Zion Market Research has published a new report titled “Adaptive Optics (AO) Market by Type (Next Generation Adaptive Optics (NGAO), Ground Layer Adaptive Optics (GLAO), Multi-Conjugate Adaptive Optics (MCAO) and Multi Object Adaptive Optics (MOAO)) by Components (Wavefront Sensor, Wavefront Modulator and Control System) Market for Communication, Industrial & Manufacturing, Military & Defense, Consumer, Biomedical and Others: Global Industry Perspective, Comprehensive Analysis and Forecast, 2017 – 2023”. 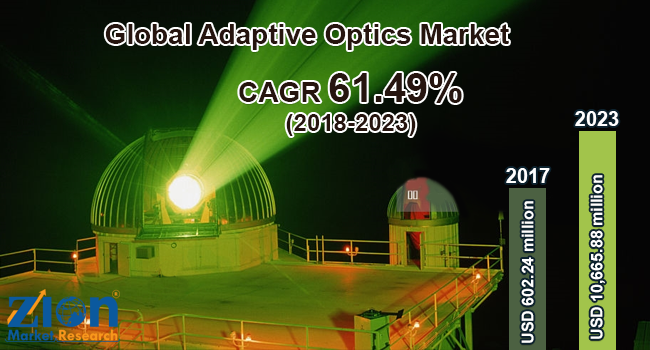 According to the report, the global adaptive optics market accounted for USD 602.24 million in 2017 and is expected to reach USD 10,665.88 million globally by 2023, growing at a CAGR of around 61.49% between 2018 and 2023. AO corrects a wavefront by an optical element which changes form when an outside control signal applied. A deformable mirror is an adaptive element with controllable reflective surface shape. By introducing the correct mirror shape, a distorted input wavefront may be improved. Turbulence in the Earth's atmosphere limit the performance of ground-based astronomical telescopes. In addition, to making a star twinkle; turbulence spreads out the light from a star so that it appears as fuzzy blob when viewed from a telescope. Adaptive optics also used for the blurring by the earth’s atmosphere, and allows earth-bound telescopes to see approximately as clearly as if they were in space. Increasing demand of adaptive optics for high-resolution microscopy, growing value for utilizing adaptive optics in free-space laser communications and utilization of adaptive optics for long-range target identification in military applications are some of the major factors predicted to fuel the adaptive optics market growth. Additionally, rising adoption of adaptive driver-assistance systems (ADAS) in automobiles paired with increased research investment and funding by government helps to further prompt demand for adaptive optics market in the analysis period. Increasing use of adaptive optics in ophthalmology and retinal imaging is estimated to support the adaptive optics market significantly in years to come. However, high initial cost and complex designing techniques may pose challenges for adaptive optics market in the forecast period. Even so, advancing adaptive optics technology coupled with development in professional astronomy is expected to open new alluring opportunities for adaptive optics market in the near future. Based on the type, global adaptive optics market is bifurcated into Next generation adaptive optics (NGAO), ground layer adaptive optics (GLAO), multi-conjugate adaptive optics (MCAO) and multi object adaptive optics (MOAO). Wavefront sensor, wavefront modulator, and control system are the component segment of global adaptive optics market. Wavefront sensor segment dominated the adaptive optics market & accounted over 42.63% of market share in 2017. A wavefront sensor is part of adaptive optics and is a device which primarily used for measuring the aberrations of an optical wavefront. Moreover, wavefront sensors helpful in evaluating the wavefront with enough spatial resolution and suitable speed for real-time compensation. Communication, industrial & manufacturing, military & defense, consumer, biomedical and others are the end user industry segment for adaptive optics market. Military and defense segment dominated the adaptive optics market and accounted for a major part of the overall market share in 2017 owing to increasing demand for large-size telescopes for ground-based high-power laser energy projection coupled with demand for space-based high-power laser energy projection. Consumer end-user industry emerged as a most attractive segment for adaptive optics market in years to come. With the largest share, North America was a leading regional market for adaptive optics in 2017 followed by Europe. The U.S. is projected to lead the adaptive optics market during the analysis period. The growth of the US adaptive optics market can be attributed to growing value for utilizing adaptive optics in free-space laser communications and utilization of adaptive optics for long-range target identification in military applications. In the Asia Pacific, China is expected to be a most attractive region for adaptive optics market owing to increasing research & development activities in region paired with the growth of ophthalmology and retinal imaging in the region. Africa region is also likely to show massive growth owing to increase spending on defense by the government. Major participant operative in the adaptive optics market is Northrop Grumman Corporation, Adaptive Eyecare, Benchmark Electronics, Boston Micromachines, Phasics Corporation, Adaptica SRL, Baker Adaptive Optics, Aplegen, IRIS AO, EOS Technologies, EOS Technologies, Holoeye Photonics, Synopsys Optical Solutions Group, Schott North America and Sacher Lasertechnik amongst others.